Another big dust storm from Africa is going to blow into Texas this weekend, and it might cause some health problems if you spend too much time outside. Jason Dunion, a scientist who studies the Saharan Air Layer — which carries the dust from Africa to the U.S. — for the National Oceanic and Atmospheric Adminitration, said Texans should expect a cloud of dust over the next day or two. 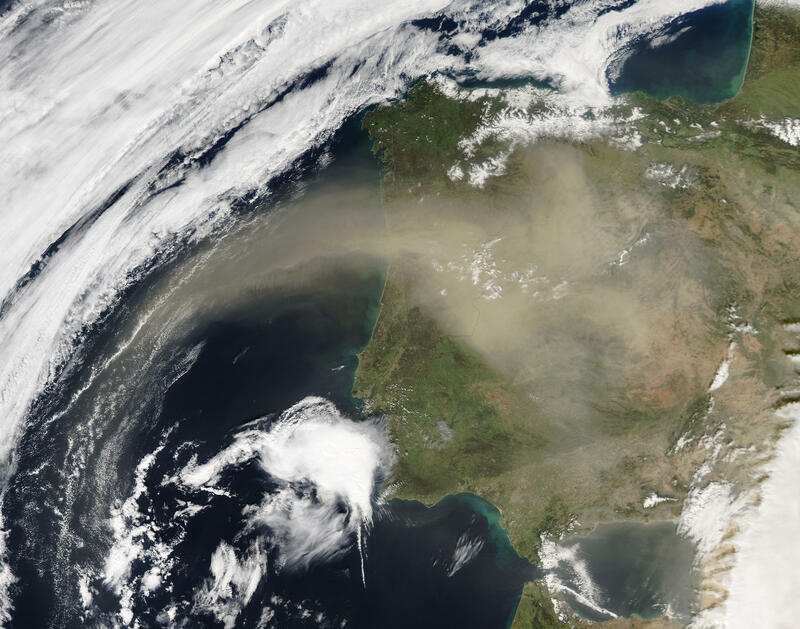 Dust from the Sahara Desert blows across the Atlantic to the U.S. every summer. "I would say all of South and Central Texas is probably going to be under the gun for this dust storm to arrive probably Saturday evening or early Sunday, so much of southern Texas will definitely experience this next round of dust storm,” Dunion said. Some dust from the Sahara makes its way to Texas every summer, which typically goes unnoticed. But bigger storms can be visible. "The sun really does light up that dust, and the way those dust particles are shaped you really see it at sunrise and sunset and it kind of has this milky white appearance when it's up in the sky overhead," Dunion said. Whether you see it or not, these dust particles get into your eyes, nose, and lungs, which can cause real problems, said Dr. Anoop Nambiar, a pulmonologist at UT Health San Antonio. "The patients who are going to be most susceptible are really going to be young children — I would also say older adults — but even more so, patients who have chronic problems like asthma, chronic obstructive pulmonary disease, and interstitial lung disease, which is also sometimes referred to as pulmonary fibrosis," Nambiar said. But even healthy people can have an inflammatory response to the foreign dust, which can make you feel sick and lethargic, he said. It can also give you sinus symptoms, including congestion and a runny nose, as well as breathing problems. Nambiar suggests that if your start to feel sick, limit your time outside. "Stay indoors where the environment is cleaner and stay hydrated. Get enough rest — that typically could get you better. And if you have no choice but to be outside, I would recommend wearing a mask, at least having some sort of respiratory barrier to protect you somewhat," Nambiar said. If you want to assess your risk for health problems associated with Saharan dust, the Texas Commission on Environmental Quality keeps track. For current local concentrations of small particles in the air, visit the TCEQ website or view the daily Air Quality Index report. Once enough data is collected, the TCEQ color codes the outdoor concentrations of small particulate matter to indicate when people may be at higher risk of health effects. Dust storm season in the Sahara Desert typically lasts until mid-August.